Make yourself at home in one of the 40 air-conditioned guestrooms. Rooms have private balconies. Bathrooms with showers are provided. Conveniences include phones and safes, and you can also request cribs/infant beds (complimentary). This hotel is set at the heart of the town of Ciudadela, on the beautiful island of Menorca. It is just a 10 minutes' stroll away from the beach. Links to the public transport network can be found just 100 metres away. Guests can enjoy a wide range of exciting activities nearby. The nearest golf club is 35 km from the hotel. This hotel welcomes visitors with warm hospitality. The guest rooms are fully fitted with modern amenities, offering functionality and comfort. The hotel offers a delightful breakfast in the mornings, for a great start to the day. Guests will be pleased by the many facilities and services that the hotel has to offer. This pleasant hostel boasts a convenient location in Ciutadella, a beautiful town situated in the western end of Minorca, in the Balearic Islands. Guests staying at this stunning region cannot miss the chance to explore the wide choice of long sandy beaches to relax on as well as the different ‘talayots' spread over the island. The charming guest rooms offer a welcoming atmosphere and functional décor ideal for guests to feel right at home. They all come with stunning views over Ciutadella's Old Town and include a fully-equipped private bathroom. Families travelling with children will appreciate the quadruple and triple rooms offering an extra space. The onsite facilities and services include a varied buffet breakfast ideal to kick start the day as well as a snack-bar. The modern 4-star Skyline Menorca apartments are located on the Paseo Maritimo in Ciutadella (Menorca), facing the sea and the Castillo de San Nicolás. Its facilities include two outdoor pools, a children’s play area, a bar/coffee shop, and a 24-hour reception. The selection of apartments feature en-suite bedrooms and fully equipped kitchens with ceramic hob, oven, microwave, coffee maker, toaster and utensils. When you stay at Hotel Port Ciutadella in Ciutadella de Menorca, you'll be near the beach and 8 minutes by foot from Castello de Sant Nicolau. 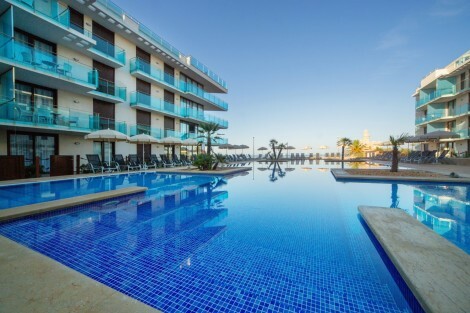 This 4-star hotel is 7.2 mi (11.6 km) from Cala Turqueta and 8.1 mi (13 km) from Macarelleta Beach. Built in 1989 and extended in 1999 a stylish and comfortable hotel. There are 30 exterior rooms some have balcony or terrace. Complete bathroom with hairdryer. There is a public salon and outdoor swimming pool with terrace. On the upper floor there is a terrace / solarium with reception area. There is a cafeteria – restaurant with a quit family atmosphere. There is air conditioning in rooms and public areas. Make yourself at home in one of the 24 air-conditioned rooms featuring iPod docking stations and minibars. 32-inch flat-screen televisions can provide entertainment. Private bathrooms with showers feature designer toiletries and hair dryers. Conveniences include safes and desks, and you can also request cribs/infant beds (complimentary). Located in Ciutadella de Menorca, Hotel Balear is within a 15-minute walk of Plaza de Alfonso III and Museum Diocesà. This hotel is 7.5 mi (12 km) from Cala Turqueta and 8.3 mi (13.4 km) from Macarelleta Beach. lastminute.com has a fantastic range of hotels in Ciutadella de Menorca, with everything from cheap hotels to luxurious five star accommodation available. We like to live up to our last minute name so remember you can book any one of our excellent Ciutadella de Menorca hotels up until midnight and stay the same night.